The festivals such, starts on the second of Dhanu. On the morning of this day, all the officials who have a part to play in the ritual are given measures of rice and clothes, according to the position that they hold in the hierarchy. At dawn the high priests from the Matham at payyavur arrive. The Vanaar presents them with gifts of clothes. The Ganapathi homam (fire offerings to the elephant god Ganapati) and Bhagasvati Seva worship Goddess Bhagavan). By noon the rituals come to a close, and the Vaanavar after giving dakshina to the Brahmins, accepts the prasadam. By evening the Adiyans deputed by Chantan, go to payavur, each carrying a torch make of bamboo. Once the aacharaveti is heard , all of them enter the Paadi with great pomp and glory. On that day, the Devasthanam of the Paadi offers the niramala in the Payavur Siva Temple. The priest of the Payyavur temple also has to follow the tantric. People receive offerings from the tantric and komaram (oracle) dress up. He whereas the black bordered new dhoti presented by the Vaanavar, on top of which he ties the red cloth called pattu. On top of this another adomment called Kaccilayum Chorayum is also tied. The traditional golden had hear bangles the yellow paste made of rice and turmeric smeared all over the body are the other adornments. The komaram after paying obeisance to the Vaanavar, walks to the Paadi with two churikas on made of silver and the other of iron. The Adiyar have to follow him with the ornaments and other objects necessary for the festival. This is accompanied by drumbeats and fireworks. Chantan carries with him a silver bow and arrow. He also carries the bhandarappetti (offering box) and the ornaments. Ascending the steps he reaches Kunnathur Paadi followed by the throng of devotees. The komaram and Chantan do their offering inside the madappura, and outside where a kalasham (pot) is kept. 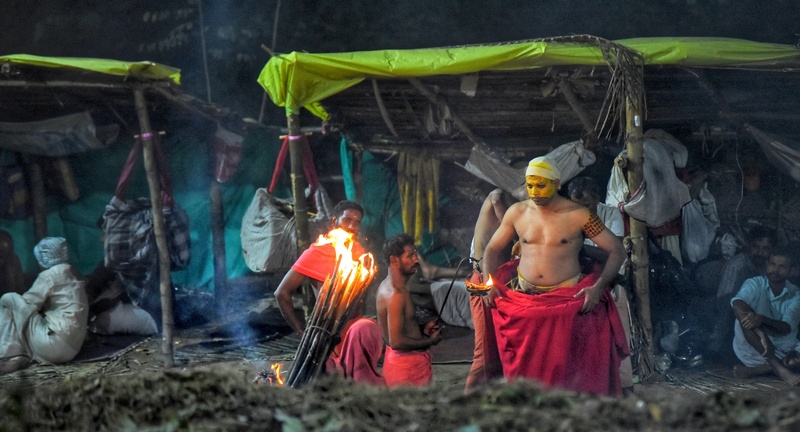 The one of the Adiya tribesmen, obeying the orders of Chantan, pay obeisance to the VAanavar who in turn gives him betel leaves and arecanut, throughthe kudupati who is an assistant of Vaanavar, doing all the necessary work associated with the temple. As soon as the betel leaf and arecanut are handed over to the Adiya tribesman, the blacksmith fastens a lamp on the pillar. This lamp has to be kept on lighted till the festival is over. When the dressing up is half way through the Komaram reaches the door of the madappura and dances in frenzy with a churika in his hand. He conversed with the present. Vaanavar and his ancestors, and receives their blessings. As soon as this is over, Muthappan is dressed up. Anhuttaan with his face made up and wearing a crown on his head now sings beautifully in the Sopanam style Kuttuvilakku which is a long handled lamp. Is held in front of his form known as tottam. Drums sound in the background. And in the front torch bearers walk the torch is made of bamboo. 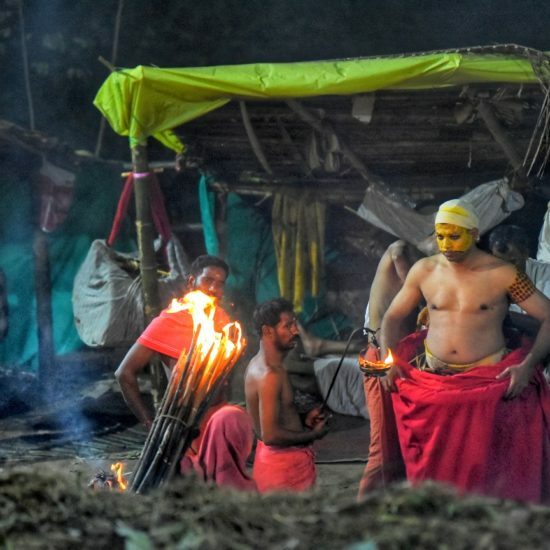 This is followed by veetu which is the distribution of toddy as and offering to the different families who have privileges to enjoy certain positions in the hierarchy of the temple. After Veethu is the second tottam. When the song sung is more melodious that the previous. Two Adiya tribes men hold the hands of the god during this time. On the second of Dhanyu Muthappan assumes four different forms. They are the representations of the four stages of the god. The first one called naaduvazhism deivam is the form of Muthappan as a baby. The god has bow and arrow as his weapon. 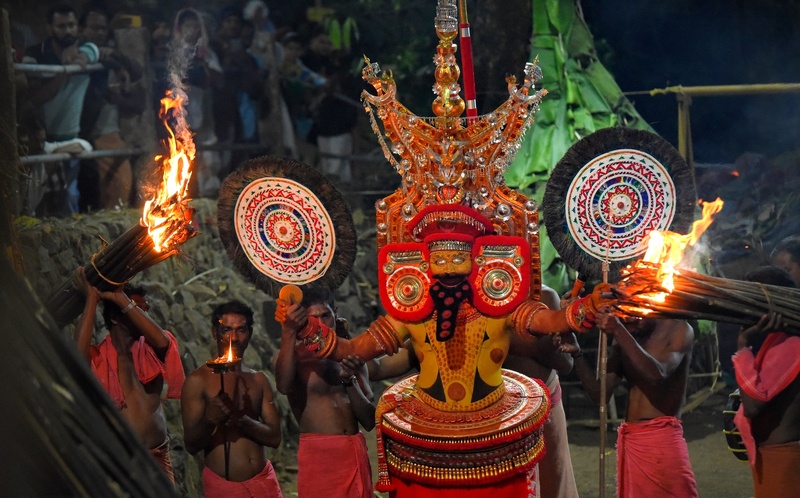 The second form, known as puthiya muthappan represents the god as a young boy. Then comes the third form which is puranakala Muthappan. The next is the usual form which is known as tiruvappana. Muthappan in this form is serious. He has black moustache and beard. He also has a false eye. Thiruvappana has majestic powers. Anhuttan has to dance in all these four forms on the second of Dhanu. The Thiruvappan can wear his head gear only after breaking a coconut daily, in front of the other deity vettaykorumakan. He comes to the front door of the madappura and wears the headgear. Fireworks resound d once the headgear is worn. As soon the head gear is worn two persons have to hold his hand and two have to hold the bamboo torch. After circumambulating thrice he walks towards the peedikakallu. He circumambulates the peedikakallu. He is made to step down from peedikakallu as soon as the food offering is ready. The food offering is supposed to have been accepted by the god, only after he circumambulates it. Then the god is supposed to visit the different people who have been related to his origin. He visits Chantan as well as the ghost of Chantan. Vaanavar and the ghost of Vaanavar also have to be paid obeisance. The present Chantan is visited only after his predecessors unseen presence is as acknowledged. Now the Adiya women bow before him. After this he blesses the flocking worshippers. The next important ritual is pallivetta (honourable hunting). The god runs around in circular motion several times. Completing the seventh round, he turns and sends an arrow towards a coconut supposing it to be a hunting game. Pallivetta comes to close with this. He listens and enjoys the drumbeats for some time. The god hand over the churika given by the Adiyans to the komaram. As soon as the komaram receives it, he is in a frenzy. After chanting a hymn, the komaram takes the god to the front of the madappura door. Now the story of Muthappan is narrated. After this is over, the Vaanavar open the bandarapetti (box of offerings). He takes out a bow and arrow made of gold and puts it again the bandarappetti. The Vaanavar gives him his offerings which is the best liquor. After this comes the turn of all the devotees who offer money and other objects for the god. These are not put in the box. They are directly taken by the god who listens to the problems of devotee. Only then does he put them into the box. Since the favorite offerings of the Muthappan are meat and liquor they are placed directly into his hands. On this day rice giving ceremony is also performed for children. A speciality is that Muthappan himself gives the rice which does not contain salt. 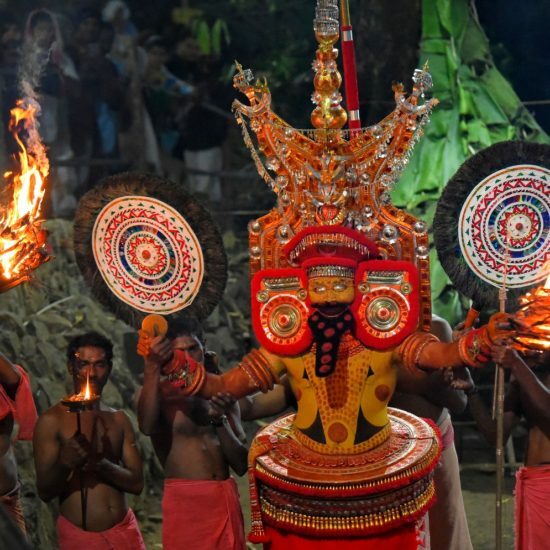 Associated with muthappan, the other deities are Moolam petta Bhagavati. Muthappan arrived at Kunnathur Paadi it is said that he was welcomed by Bhadrakali who was staying in the paadi after killing the demon Dharika. She is Moolan Petta Bhgavathi. During Muthappans travel to conquer the whole world he me the person created by Lord Siva, doing penance covered with roots and white ants. Muthappans bow touched the covering and he woke up. This is Vellattam. From then, they became friends. Veettaykormakan and Uurupazhassi are the local deities of the Paadi. As in the beginning at the end of the festival too the place is purified. But now the god himself sprinkles holy water all around. It should be remembered that during the beginning of the festival Muthappan was brought from the top of Puralimala. Now he has to be propitiated and send back. On the 2nd of Makaram after one month of festivity is over, there is a ritual called Kaliykkappattu, for which the god circumambulates by running, and after kicking aside the burning embers on two sides, enters the Madappura. After this the Adiya women cleans up the surroundings. Anhuttaan assuming his ordinary attire, circumambulates the stone representing Muthappan, and requests him to go back to Puralimala. It is supposed that the Lord according to the request sets off to Puralimala. After three days on the sixth of Makaram is a ritual called Kariyatti. The lamp that is lighten on the second of Dhanu is ablaze for the whole month. During these days no ritual to favour Muthappan has to conduct in any other place except Kunnathur Paadi. The god has ordained that those who wants to see him on at this time should visit him at Kunathur Paadi alone, and not where else. On Kariyit day Chantan removes the lamp and at that time the doors of all others places and houses have to be opened and lamps lit. The variety of rituals and their complexity of Kunathur Paadi are intriguing. Muthappan rules the lives of the folk there. They know that they can rely on this omniscient, omnipresent deity, This deep faith and total sublimation to Muthappan makes them conduct the rituals in the most faithful manner. 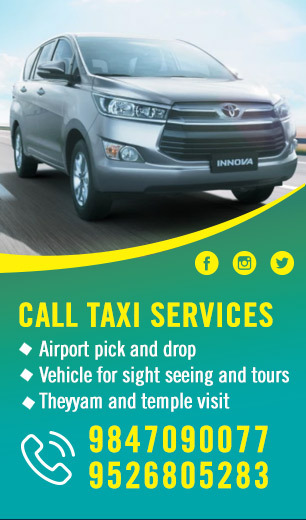 Please contact us for customized tour packages for Kunnathur Paadi Temple.